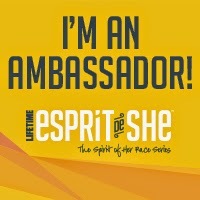 I am an Esprit De She Ambassador.. YAY! This comes as very exciting news… and just the motivation I needed to get thru this holiday slump. I have been so down, not consistent, and needing motivation to get in the workouts I need to prep my body for Ironman. This race embodies the spirit of a strong and confident woman. It supports Girls on the Run and their mission, and I couldn’t be more thrilled to be a part of this women’s only race series! I want to prove that I am what they need and want to support this racing event, and those women involved. I can’t wait! I hope some of you will sign up with me! I am FOR SURE doing the oceanside race on Oct. 18. I did this last year. It was so fun… and that was just flying SOLO! Use this link: http://bit.ly/SANDIEGOTRI to go sign up if you want, and enter this code at checkout in the promo code area: EDS059. Do it before Dec. 31 and get the perks from me with some free gear! Looking forward to adding this to my Ironman journey! ← I truly have THE BEST “fans”!